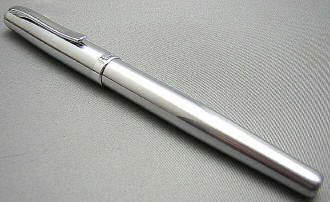 "I received my pen yesterday afternoon - the "209". Great feel. I like it. I'm sure I'll be purchasing more. Thank you." Here's a sleek, classy pen design, with a matte black finish and gorgeous 22K gold-plated nib. 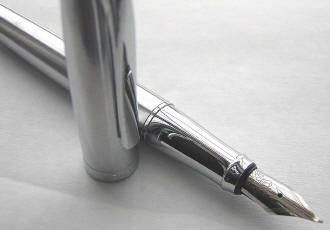 A mid-sized pen, it measures 5-1/4" capped, and just shy of 5-3/4" posted. Capped, the 209 is minimally highlighted by the gold of the curvaceous spring clip, and by the center cap band, which is simply engraved with 'DUKE' and '209'. The bottom of the barrel has a graceful sweep to its shape, added a distinctive silhouette to the design. 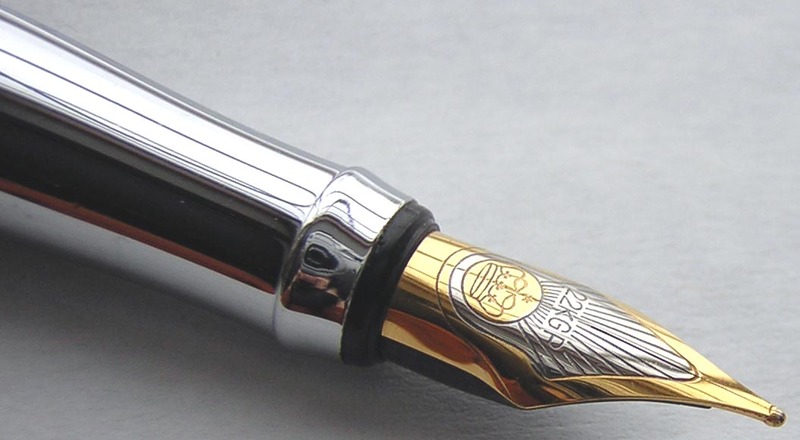 Removing the slip cap, which securely clicks back into place, displays the polished steel section, and the beautifully scalloped 22K gold-plated medium nib. This is perhaps the most beautifully engraved nib I've seen on a pen in this price range. The DUKE 'crown' logo is used to great effect, and it produces a stunning appearance. The thin gold band separating the section and the barrel is also a nice design element, which is hidden when the cap is in place. Unscrewing the all-metal fittings between those parts reveals a large capacity piston converter for bottled ink. 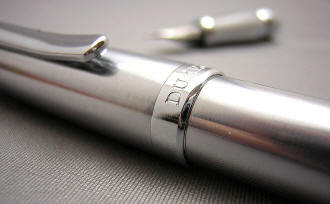 An inexpensive pen that will look great whether in the boardroom, or for a night on the town -- dressed to the nines! Both nibs can be had with one Chrome Flighter pen body in the Dual-nib kit here. As can be seen from the upward sweep of it profile, this type of nib bears no relationship to a western-style calligraphy nib. This nib should be thought of more as a 'metal brush', designed to approximate the brushstrokes used in traditional Chinese calligraphy. 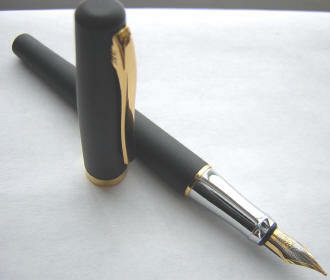 Although words can indeed be written with this style of nib, it should in no way be considered a regular writing pen. 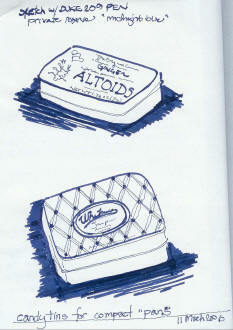 Even to describe the point as a 'medium' doesn't really mean too much in a conventional fountain pen sense. I certainly can't say that I've mastered writing or drawing with the pen, but it's been fun trying . Unscrewing the all-metal fittings reveals a large-capacity pump-style converter for use with bottled ink. 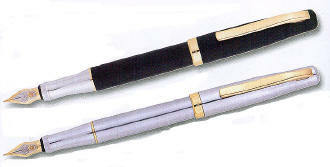 The pens come boxed in a simple cardboard pen box which includes two ink cartridges as well.